Item no. 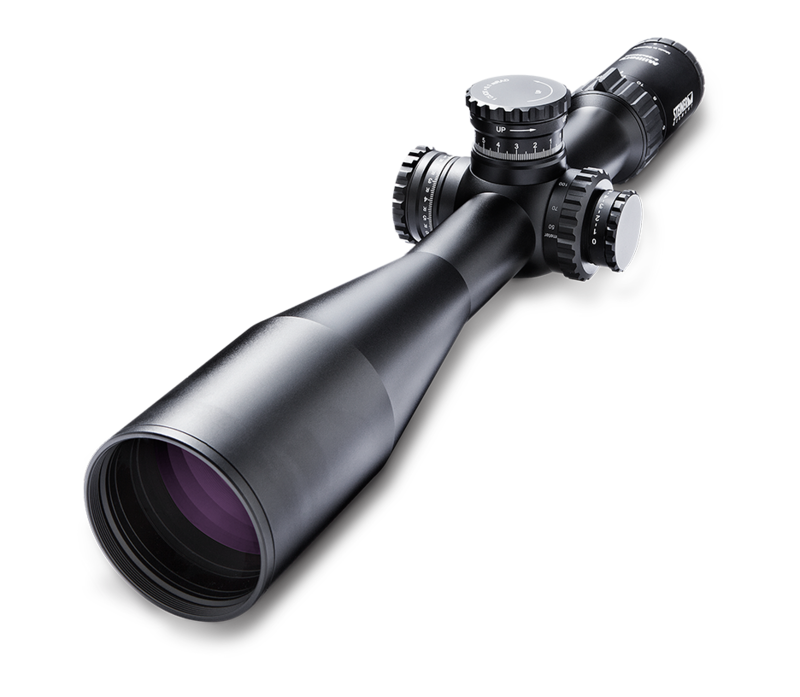 8704-MSR V2 (MSR2, black) Details on MSR2 reticle here. Orders directly from Steiner are available only to US residents. M5Xi Military 5-25x56 is rated 4.9 out of 5 by 35. Rated 5 out of 5 by Prodigy951 from M5Xi and Larue love the combo So I love the M5xi best scope I've on to date. Turrets are smooth glass is very clear from 5-25 but what do you expect from a 3+k scope. It's pretty durable expect the turrets they will get beat up also the coating chips pretty easy. I know most people baby there rifle but I don't. In real world use Steiner expects snipers to paint over the coating anyway. Hands down the best thing about the M5Xi is the warranty. The no question ask which I put to the test when I destroy my turret covers they sent me one out at no cost. Which I was expecting to purchase because it was not a manufacture defect. Guns fires 0.5 moa with m80 at 100 yards thanks Steiner. Rated 5 out of 5 by Firedude68 from Amazing German glass! Excellent craftsmanship! I purchase my 5-25x56 MSR scope 2 years ago for my M21 Tactical rifle. The glass is simply amazing and the clarity of the optics is simply phenomenal. With so many features of a 34mm main tube, 56mm main objective, excellent eye relief, 1/10 mil adjustments, First Focal Plain, the MSR reticle is top notch. Low light performance surpass my expectations. The Illuminator is co-located on the parallax adjustment knob so there is no unsightly 4th knob which in my opinion gives the scope a more streamlined look. The whole thing is set up in the most user friendly manner and its intuitive on how to use. Seriously nothing negative to mention. I would say their customer service representatives are knowledgable, professional, and attentive to my questions and concerns. I am sold on the company and their products as a faithful customer. Rated 5 out of 5 by Thunderinthehills from I did my research for months because this was going to be a huge investment for me. It paid off. I have one of the finest top scopes in the world. Take the plunge and step up and you will not be able to fault this scope or regret this purchase. From 50yrd to a 1000yrd is your riffle up to the challenge? Rated 4 out of 5 by Steger47 from Great scope Recently purchased a t5xi and I have a few impressions. Mounting the scope normally requires leveling the rifle then the scope with bubbel level on the turret. The reticle was extreamly canted, not sure if that is by design. I leveled the reticle using leveled lines at a distance and a machinest level on the reciver. Kind of a disappointment was the light. The lack of an affirmative click alows the light to flicker kind of on kind of off. The scope is very capable and solid very solid and the glass is clear and is a joy to look through. The reticle is a great design and the light looks excellent. Rated 5 out of 5 by Texas Cowgirl from Steiner Quality!! Steiner is a brand whose quality you can count on. I met Seth from Steiner at the NRA 2018 convention at the EuroOptic booth and had the chance to look at the Steiner products in person. I had been contemplating purchasing a Schmidt and Bender scope for 3 years but just couldn’t get myself to pull the trigger. When I saw the Steiner scopes I was sold immediately! The glass quality is perfection, light transmission is like none I have ever seen before, and the edge to edge clarity makes it easy to get in the eye box and quickly acquire your target. The Heritage Warranty is the icing on the cake and Steiner’s customer support is incredible! When you purchase a Steiner Military Series scope you get the most durable scope with hand picked glass that has been tested to Military standards. If you are considering this scope, don’t hesitate! If you enjoy shooting, at any level, you will LOVE this scope!! Rated 5 out of 5 by Tim K from Tracks perfectly Summary: I tested 3 brand new Steiner T5Xi scopes, two of the 5-25's and one 3-15's. I tested for tracking accuracy, reticle alignment, and return to zero. With two very minor exceptions that will be detailed below, all three scopes performed perfectly. Introduction: I've been testing scopes for years now, ever since I got a bad one from another manufacturer. Over that time I've developed the jigs, test targets, and procedures to yield accurate testing. I decided to convert three rifles over to Steiner's new line so I could have the same reticle across the board. I had available to test a 3-15 I bought for an AR a few weeks ago, a 5-25 I bought for my bolt gun a few days ago, and a second 5-25 that a local shooter just purchased for a new rifle. The 3-15 had a couple hundred rounds on it. My 5-25 had been mounted and 25 rounds were fired. The second 5-25 was new in the box. Test Setup: I created a test target using my CNC Router. I set it up 50 yards from the test position, so each line represents 2 milrads at that distance. The test target is hung plumb. Plumb was checked with a Stabila carpenters level, and I turned the level in all four orientations to confirm that the level itself is accurate. The scope test jig is a section of picatinny rail mounted to an adjustable base. The first step in the procedure it to level the rail in both directions. I used a machinery level to accomplish this, and again turned the level in both orientations to rule out any error in the level itself. After mounting the scope to the jig I adjusted it for parallax. This posed a problem for both 5-25's as the minimum distance on the dial is 50 meters and I was testing at 50 yards. At the 50m setting, parallax appeared to be close, but not perfect. This forced me to be very careful about eye position during the tracking testing and is a potential source of error in the results. I loosened the rings and adjusted the scope so it was perfectly plumb. I did this by checking the travel of the erector. Once I had it so the reticle traveled directly up and down the line on the test target, I tightened the rings. That completes the test set up. Procedure: The first step of my procedure was to see if the reticle was plumb, or parallel to the erector travel. I did this by simply observing any deviation of the reticle from the test target. It was relatively easy to estimate the rise and the run of the angle using the reticle itself and then calculate the angle using simple trig. The second step was to check the reticle to see if it was accurate. Again, I completed this test by simply observing if the retilce matched up to the lines on the test target. The third step was to test tracking. I did this by looking through the scope and turning the dial until the reticle had moved down the target 2 milrads. I then looked at the dial to see how many milrads it indicated. I recorded the data every 2 mils until I ran out of travel or test target. I repeated this test 3 times on each scope, checking every two milrads. I checked both on the way up and the way down. At the end of each cycle, I confirmed that the scope returned to zero. Results: My personal 5-25 was tested first. I found my reticle to be canted about 0.6°. The reticle accuracy was perfect. Tracking was exactly on. Every time I looked up at the dial, I had moved it exactly 2 milrads. Because this scope had already been mounted and zeroed, I only had 16 milrads of travel so that's as far as I tested it. My friend's 5-25 was next. His reticle indicated that it was canted about half as much as mine. That's within the margin of error for my test set up, so I'm willing to call it perfect. When checked for tracking, it looked like it was 1/2 click off across the entire range. At 2 milrads indicated on the dial, the reticle was just short of the line. At 2.1 milrads indicated, it was just past the line. The "error" did not increase with increasing travel leading me to believe that it's something I was doing. I checked the initial position a number of times and it appeared to be right on the line, but the aforementioned parallax problem may be to blame. The apparent error was right on the border of what I think this test set-up is capable of detecting, so I'd be willing to call it perfect. To be perfectly clear, even at 18 milrads indicated, the apparent error was only 1/2 click or 0.05milrad. My personal 3-15 was last. The reticle was canted about 0.5°. Reticle accuracy was perfect as was tracking. It's interesting to note that this scope focuses down to 25 meters, so I was able to set paralax perfectly. This made a surprisingly noticeable difference in how easy it was to check tracking. I'm not convinced that the error I thought I detected on the second 5-25 was not just parallax error showing up in my measurements. Conclusions: The three examples that I tested are close to perfect. The only possible problems I saw were two reticles that were off by 1/2° and a possible tracking error that was more likely test error. In the event that it was real, it's also irrelevant. An error of 0.05 milrad in elevation across the entire travel is nothing that would concern me in the slightest. I own two of the scopes tested and have need of a third for my .22 trainer. I will not hesitate to buy my third. Rated 5 out of 5 by Texas Cowboy from Perfect Steiner M5Xi 5-25x56 with H59 is a perfect all round tactical scope. Mounted to Tikka TAC A1 in 6.5 Creedmoor, this is one of the few scopes that takes advantage of an unbelievable gun! Don’t go chasing the latest fads, buy one! This is everything a PMII wants to be. Your are getting a hand picked scope that has gone through all the testing. The paper talks and this scope does the job! Rated 5 out of 5 by Mister Donut from My second Steiner optic I bought the T5Xi a few weeks ago for one of my .308s and needed something for a .50BMG I ordered. A rep from Stoeger Canada recommended I buy this one for it so I did. I haven't had time to try it out yet because I'm still waiting for the rifle to arrive, but from playing around with it so far, I like what I see. Nice clear glass, and I'm no expert but it feels on par with some other companies that cost at least $1000 CAD more. I know this is of little importance, but I was surprised that the packaging for this scope wasn't as nice as the T5Xi. The box for the T5Xi was nearly twice the size and came packed in a foam cut-out that was formed to the optic. For the M5Xi, it came with two foam rings in a much smaller box. Again, very little importance because it's the scope itself that's important, just a little surprised, that's all. When will the updated MSR reticle be available for purchase, on the M5Xi series? Typically this happens when there is not enough cant in the scope mount. The scope's elevation adjustment can be reset using the set screws int he elevation knob, but if there isn't additional adjustment available, a mount or base with more cant towards the barrel may be required. What height rings would you recommend for m5xi 5-25x56? It will be mounted on a AR-10? Extra High or a Cantilever Mount. I would like to change the reticle in my optic to a horus. What are my options to have this done? Also, besides cerakote, can I get the factory FDE coating which your scopes can be purchased? Hello, We do not offer reticle changes or refinishing services currently. Sorry for the inconvenience. Are there Bullet drop compensators available for the M5Xi or could it be made as a custom service ? The M5Xi series of riflescope does not have BDC available and comes equipped with our G2B mil-dot reticle or MSR reticle. Both reticles are in mils.